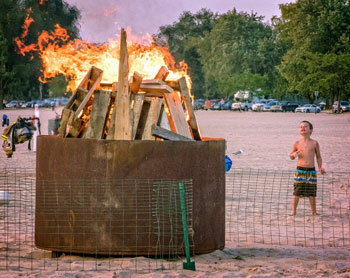 For three Thursday nights this summer, head to Ludington's Stearns Park Beach for a special Sunset Bonfire! These Sunset Bonfires are FREE and open to the public, and include live music by local talent. Who doesn't enjoy a bonfire during the summer? Add Lake Michigan, the beach, and the gorgeous Ludington sunsets, and you've got absolutely the best setting. So join your friends, neighbors... and maybe meet somebody new... at the Sunset Beach Bonfire Series, every 4th Thursday of the month this summer. This event is sponsored by the Ludington Area CVB. What time does the sun set over Lake Michigan? Click here to find out! On the 4th Thursday of each month (June-August), bring your blanket or beach chair to the south end of Stearns Beach from 8-10pm and enjoy a huge bonfire while listening to some great music. Stearns Beach (at Stearns Park) is the city's largest beach, with 2,500 feet of sandy shoreline. There is plenty of FREE parking. Much of the angled parking at Stearns Beach looks out over Lake Michigan, ideal for sitting in your vehicle for a front row seat to one of Ludington's spectacular sunsets. Concession stands are found at both the north and south ends of Stearns Park, providing food, beverages, restroom facilities here, and drinking fountains. Across from the beach and Stearns Drive is a large, grassy area with picnic tables and grills. At the south end of Stearns Park, you will find access to the half-mile long pier which takes you to Ludington's North Breakwater lighthouse. The south end of Stearns Park also features a Skate Plaza, shuffleboard courts, beach volleyball, the Jaycees Mini Golf Course, concession stand, a beach playground and an accessible walkway down to the shoreline. The north end of Stearns Park has an accessible walkway that has been constructed by the north concession stand. The walkway provides the handicapped with access down to the water from the parking lot. Coming through downtown Ludington, follow Ludington Avenue to the end, and turn right onto N. Lakeshore Drive. Approximately four blocks down, you'll find the entrance to Stearns Park on your left.